Make others feel your presence by sending this Soothing Gift Combo and let them feel very delighted. 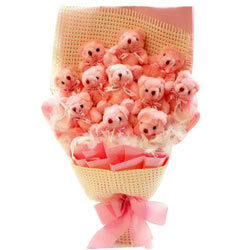 This fascinating 11 Pcs Teddy Arrangement is decorated with Tissue Cotton Cloth and tied with a Satin Ribbon. Flowers Delivery Gurgaon, Send sweets Tiruvananthapuram, Wedding Cake Tatanagar, Diwali Mithai Surat, Send Flowers and Gifts to Kollam, Online Shop Raichur, Flower to Nizamabad, New Year Flowers Tatanagar , Fresh Fruits Panipat, Send Gift Mirzapur, Dry Fruits to Belapur, Birthday Delivery Nanded, Sending to Delhi, Flower shop Proddutur, Pune Online Cake Delivery.